Is 53 inches in diameter at the base and 37 inches high. The drinking bowl capacity is more than 30 gallons. The water depth is easily adjustable. Constructed of a durable space age plastic that will not crack or deteriorate under severe climactic conditions or high impact. Any horse owner who wishes to provide clear, clean water to their horse in a pasture setting automatically would benefit from an Equuspring pasture waterer. Horse operation managers and owners who have used Equuspring pasture waterers like them so much they put them in wherever they go, or when expanding their operation with more land or horses. If you need an automatic pasture waterer, the Equuspring has all the features you need to provide fresh, safe, controlled, dependable water to your horses. Our goal at Equuspring is to provide fresh water automatically to horses as they need it in the field. We are determined to produce the best, most economical pasture waterer on the market today. We accomplished this by identifying the most important features a pasture waterer needs. We have identified the top concerns of horse owners requiring a dependable pasture waterer and with this information, are able to produce a waterer that combines all of them. 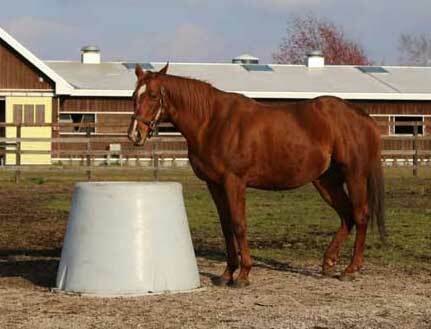 Safe A horse pasture waterer should be safe, with no sharp edges or angles that a horse can snag with their mouth, foot, tail, or any body part. The Equuspring is constructed with no sharp angles. It is completely round so there is very little chance a horse could become snagged on it. The shape of the Equuspring provides another safety feature because the bottom is much larger than the top. This design feature is important because it makes it very difficult for the horse to tip or move the waterer. It is suggested that every waterer be staked to the ground for additional stability. Design The top of the waterer should to be tall enough that horses cannot easily get their feet into it and possibly become injured. The Equuspring waterer is a vast improvement over ground-level troughs and bathtubs which are often difficult to clean and in some instances low enough for a horse to put foot into. The way the Equuspring is designed, it would be difficult for the horse to do, since the top of the waterer is 36 inches tall and 53 inches around at the bottom. This is substantially taller than the average cast iron bathtub. 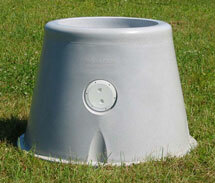 The Equuspring pasture horse waterer is designed by horse owners for horse owners. Durable and Dependable The waterer should be able to withstand abuse such as horses kicking it. The plastic used to make the Equuspring pasture waterer is resistant to UV rays, giving it the ability to be very durable to sunlight, providing a proven 20 years and beyond of service. We have improved the design based upon customer feedback by making the walls thicker to be more rugged, especially along the areas subject to kicking and abuse. Options A heated model is available for cold climates. It uses household 120 volt AC current. The fully automatic EQUUSPRING is a safe, inexpensive way to provide fresh, clean water to horses and livestock all year round. There are several basic features a good automatic horse pasture waterer should have. When purchasing a waterer, the buyer should be aware of safety, water control, design, maintenance, durability, and dependability. 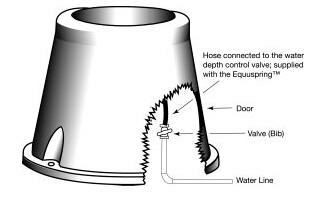 The Equuspring horse pasture waterer is produced to include all of these features. Modern horse pasture waterer technology has come a long way from the memories some of us have of the horse trough on our grandfather’s farm made from rock and concrete, with water supplied by a windmill. A long time ago that was one of the only methods available to provide an automated method of delivering fresh, clear water to horses. The Equuspring raises the bar for a new era in pasture water technology. Water Control We use a valve to control water level in the horse waterer that is exactly the same as the one used in millions of homes to control water level in toilet tanks; it does not use a float, but opens and closes dependent upon the water level. The water level may be adjusted using the built-in adjusting screw. 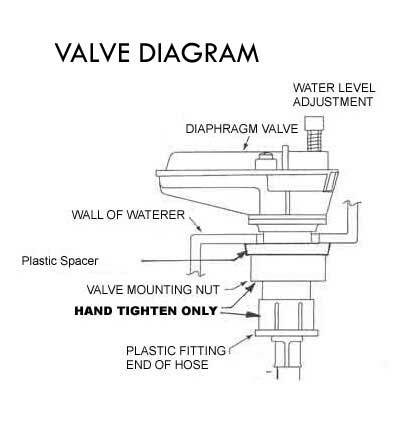 The pre-determined setting of the valve establishes the water level with a capacity of over 30 gallons. Maintenance The Equuspring has a smooth plastic surface inside the bowl. This smooth surface makes cleaning easy with a plastic brush. The height of the water bowl makes cleaning much easier than any ground-level bathtub. “Dirty” water is removed by pulling a 3” diameter rubber expansion plug from the bottom, allowing the water to drain onto the ground under the Equuspring. Fresh water then flows into the bowl and continues until the level is reached and then shuts off. Any existing mosquito larvae are flushed completely away during the draining process because the drain is in the absolute bottom of the bowl. The height makes it unlikely that a horse or other animal will put a foot into it. All Pasture Waterers come with 1 year guarantee parts and labor. Total wt. under 70 lbs.